Dr. Shu Q. Liu is interested in cardiovascular protective engineering, the engineering aspect of cardiovascular protective medicine. 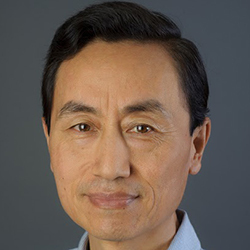 In particular, Dr. Liu intends to understand the naturally occurring systems protective mechanisms in ischemic disorders – ischemia in an organ can activate protective mechanisms involving not only the ischemic organ, but also distant organs that discharge cells and/or proteins to protect the ischemic organ from injury. These systems protective mechanisms augment the survival capability of the injured organ, thereby reducing organ failure and mortality. The naturally occurring systems protective mechanisms can be used to develop engineering strategies for treatment of ischemia-induced disorders. Shu Q. Liu. Bioregenerative Engineering: Principles and Applications. Wiley Interscience, New York, 2007. Fung Y.C. and Liu S.Q. Change of residual strains in arteries due to hypertrophy caused by aortic constriction. Circulation Research 65:1340-1349, 1989. Liu S.Q., and Fung Y.C. Influence of STZ-diabetes on zero-stress state of rat pulmonary and systemic arteries. Diabetes41:136-146, 1992. Liu S.Q., and Fung Y.C. Changes in the structure and mechanical properties of pulmonary arteries of rats exposed to cigarette smoke. American Review of Respiratory Disease148:768-777, 1993. Liu S. Q., Fung Y.C. and Yen M. On measuring the third dimension of cultured endothelial cells in shear flow. PNAS91:8782-8786, 1994. Fung Y. C. and Liu S. Q. Determination of the mechanical properties of the different layers of blood vessels in vivo. PNAS92:2169-2173, 1995. Liu S. Q. Prevention of focal intimal hyperplasia in rat vein grafts by using a tissue engineering approach. Atherosclerosis140:365-377,1998. Liu S. Q. Focal expression of angiotensin II type 1 receptor and smooth muscle cell proliferation in the neointima of experimental vein grafts: relation to eddy blood flow. Arteriosclerosis, Thrombosis & Vascular Biology 19: 2630-2639, 1999. Li Y. C., Kong J., Wei M., Chen Z.-F., Liu S. Q., and Cao L.-P. 1,25-Dihydroxyvitamin D3 is a negative endocrine regulator of the renin-angiotensin system. Journal of Clinical Investigation 110: 229-238, 2002. Goldman J., L. Zhong, S. Q. Liu. Degradation of alpha actin filaments in vascular smooth muscle cells in response to mechanical stretch. American Journal of Physiology Heart and Circulatory Physiology 284: H1839-H1847, 2003. Liu S. Q, Tieche C., Tang D., and Alkema P. Pattern formation of vascular smooth muscle cells subject to non-uniform fluid shear stress: Role of platelet-derived growth factor beta receptor and Src. American Journal of Physiology Heart and Circulatory Physiology 285:H1081-H1090, 2003. Liu S.Q., Tieche C., and Alkema P.K. Neointima formation on elastic lamina and collagen matrix scaffolds implanted in the rat aorta. Biomaterials25:1869-1882, 2004. Liu S. Q., AlkemaP. K., Tieche C., Tefft B. J., Liu D. Z., SumpioB. E., Caprini J. A., LiY. C., and PaniaguaM. Negative regulation of monocyte adhesion to arterial elastic laminae by signal-regulatory protein alpha and SH2 domain-containing protein tyrosine phosphatase-1. Journal of Biological Chemistry 280:39294 - 39301, 2005. Goldman J., Zhong L., and Liu S. Q. Negative regulation of vascular smooth muscle cell migration by blood shear stress. American Journal of Physiology Heart and Circulatory Physiology, 292:H928-H938, 2007. Liu S. Q., Tefft B.J., Zhang A., Zhang L-Q, and Wu Y.H. Formation of smooth muscle alpha actin filaments in CD34-positive bone marrow cells in elastic lamina-dominant matrix of arteries. Matrix Biology 27:282-294, 2008. Kong J, Qiao G, Zhang Z, Liu SQ, and Li YC. Targeting VDR Expression in Juxtaglomerular Cells Suppresses Renin Expression Independently of PTH and Calcium. Kidney International 74:1577-01581, 2008. Kong J., Qiao G., Zhang Z., Liu S.Q., and Li Y.C. Transgenic Expression of Human Vitamin D Receptor in Juxtaglomerular Cells Suppresses Renin Expression Independently of Parathyroid Hormone and Calcium. American Journal of Pathology 177:622-631, 2010. Szeto F.L., Reardon C.A., Yoon D., Wong K.E., Chen Y., Kong J., Wang Y., Liu S.Q., Thadhani R., Getz G.S., Li Y.C. Macrophage Vitamin D Receptor Signaling Inhibits Atherosclerosis in Mice. Molecular Endocrinology 26:1091-1101, 2012. Liu S.Q., Ren Y.P., Zhang L-Q, Li Y.C., Phillips H., and Wu Y.H. Cardioprotective proteins upregulated in the liver in response to experimental myocardial ischemia. American Journal of Physiology Heart and Circulatory Physiology 303:H1446-1458, 2012. Liu S.Q., Roberts D., Kharitonenkov A., Li Y.C., Zhang L-Q., and Wu Y.C. Cardioprotective action of fibroblast growth factor 21 upregulated and released from the liver and adipose tissue in experimental myocardial Ischemia. Scientific Reports 3:2767, 2013. Liu SQ, Roberts D, Ren Y, Zhang L-Q, and Wu YH. Trefoil Factor 3 as an Endocrine Neuroprotective Factor from the liver in Experimental Cerebral Ischemia/Reperfusion Injury. PLOS ONE 8:e77732, 2013. Chi Y, Wang L, Liu YY, Ma YH, Wang RJ, Han XF, Qiao H, Lin JB, Matsuura E, Liu SQ, Liu QP. 7-ketocholesteryl-9-carboxynonanoate enhances ATP binding cassette transporter A1 expression mediated by PPARγ in THP-1 macrophages. Atherosclerosis 234:461-468, 2014. Liu SQ, et al. Trans-systems mechanisms against ischemic myocardial injury. Comprehensive Physiology 5:167-192, 2015. Wang J, Chen L, Chen B, Meliton A, Liu SQ, Shu Y, Liu T, Deb D, Solay J, Li YC. Chronic activation of the renin-angiotensin system induces lung fibrosis. Scientific Reports 5:15561, 2015. Tefft BJ, Kopacz AM, Liu WK, Liu SQ. Enhancement of endothelial cell retention on ePTFE vascular constructs by siRNA-mediated SHP-1 or SHP-2 gene silencing. Cellular and Molecular Bioengineering 8:507–516, 2015. McCarthy C, Ahrens D, Joda D, Curtis T, Bowen P, Guillory R, Liu S, Zhao F, Frost M, Goldman J. Fabrication and short-term in vivo performance of a natural elastic lamina - polymeric hybrid vascular graft. ACS Applied Materials & Interfaces 7:16202-16212, 2015. Shi Y, Liu T, He L, Dougherty U, Chen L, Adhikari S, Alpert L, Guolin Zhou G, Liu W, Wang J, Deb D, Hart J, Liu SQ, Kwon J, Pekow J, Rubin D, Zhao Q, Bissonnette M, and Li YC. Activation of the Renin-Angiotensin System Promotes Colitis Development. Scientific Reports 6:27552, 2016.